We don't want OMV drama thread is locked right??? @Erin Lokanata Sorry 2 bring u here chingu but I'm scared if MOD warning again us. So my chingu @szne09 posted about the harsh comments from shippers on SMA IG acc. Maybe the awkward is because of this. But in the other side, I also think the same with u, maybe they already filmed that 'comf n ero night' or on going for it. But what I see is SMA who is awkward 2 SJS but SJS is opposite. He seems getting a HAPPY VIRUS 2nite n also he appears so manly, protective man, so comfortable, and confident. I think he can appears awkward on the stage bec over all this is his comeback drama after Master Sun. And he's so protective towards SMA 2nite. I have 2 get reasons 4 SJS action 2nite. Maybe some1 here who is originally fan of SJS know his personality and it will be better if it's rational explanation based on SJS personality. Hi guys! Sorry if I caused any misunderstanding. I saw comments such as this: "break up with KWB and date SJS!" "Date SJS instead!" - things like that. It wasn't anything too harsh or evil, but still inappropriate. Overzealous fans tend to do that. I don't know where those comments are now but I did see them. And sometimes fans tag her in pics too, like date SJS and then tag SMA. It's just awkward. Anyways, that was it. Nothing crazy or harsh. Sorry for the worrying! I am so happy today that SJS won best actor and SMA won best actress and both of them won best couple. I really like how SJS has been such a gentleman to SMA by holding her hands leading to the stage and he always seems so caring about her. He is so polite to everyone. When he got on stage to get the best couple award. He was the only one that started to greet others standing next to him. Aigoo I hope there's someone post here (pic or vid or gif) when SMA is doing that famous shooting dimple in KBS drama award after the mc is asking them 2 act of it. OMG.... lol I almost spit out my coffee. Thanks @Reyko for the laughs! Yay a forum for the "out of this world" couple! I loved that SJS held her hand while walking to receive their award. Isn't he known as an introvert?! I love woo bin , but sorry baby, you still have the military to attend and we can't have our girl waiting around for you. She isn't getting any younger and is at the appropriate age to settle down. Does anyone have clips of when SJS acted out the plank move on the host? Haha awww he won't be In my opinion, he's a professional and seasoned actor. It's not like this is the first time he's exhibited chemistry with an actress. 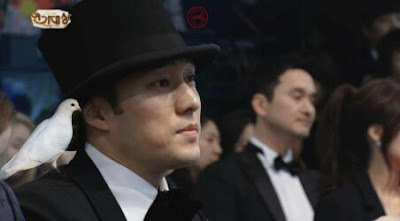 There's a large following of him and Gong Hyo Jin (I didn't know she is one of SMA's close friends!) as well. He seems to adore her so I am hopeful that they'll maintain their friendship or whatever they choose to be! As a Mina fan for many years, I agree with @szne09 that SMA is really hard to read. She's so private about her life, and even followed her for these many years, we still don't know much about her family except family member numbers LOL. Before KWB, she didn't share anything about her lovelife either. This did make me suspect that maybe she and KWB were not a real item. But I choose to believe her words anyway. I don't wanna say much about her lovelife. But when she and SJS first met for giordano, I think she had a boyfriend then. Now with OMV, the situations were kinda the same. And this time, even SJS most probably have a girlfriend. They are both shy and have a high moral standard, hate to be a negative one, but I don't think they have that courage to follow their feelings (if there's any). According to their personalities, I really don't think they are close or even friends with each other before OMV. That giordano ads just showed how good they look with each other and how shy people can still have chemistry on screen. They've always had bad timing. But I hope this time they can remain friends first. The comparisions between KWB and SJS are unnecessary. They're very different. I personally prefer SJS's personalities more. KWB and SMA are different people too. I don't know why, but I feel that they'll seperate way before his military service. I never shipped any couple before, and I can't even explain why I am here and why I want them together so badly. I guess I have to follow my heart this time LOL. Regarding SMA's performance tonight, girls, this is SMA being her normal self in front of the camera. She's really shy, like really really SHY. She can play cute and all those sides while doing cfs or dramas or movies. But when she's SMA, she's always reserved. Plus I think she's been extremely careful to aviod scandals. @siasia_stv, thank you so much for sharing your insight! I can't wait to see how the last two episodes play out. I really hope we don't see arranged marriage issues cuz that's the oldest trope in the book lol so we shall see! I already hated those time jump and seperation for one year cliche, if there will be any arranged marriage, I will seriously suggest the writer to stop writing!!! I'm going to pull a defense on behalf of our girl. I'm a pretty observant person and I noticed a few things. I'm not sure why there is so much criticism for SMA being 'awkward'. It's like getting upset at someone for who they are. Anyone who has followed her in the past 15 years that she's been a model + actress would know this is how she carries herself. The industry she's in scrutinizes and watches her like a hawk because she's considered one of the goddesses simply for her 'bagel' figure (categorized by netizens and Korean media). When she was in Guerilla Date, she has said she wants to ban that label because it puts on a lot of pressure on her and I had never seen her put on such a sad face when she said that. As much as she tries to 'act calm and collected', she obviously wears a sensitive sleeve to her emotions in certain circles and public spaces. In interviews with SMA's celeb friends, including Gong Hyo Jin, they have often said that when you truly get to know the real SMA-- she is herself-- funny, charming, and exactly like many of the characters she plays (and sometimes it shows as we see on OMV, note: Christmas scenes). @siasia_stv and @blueroses both nailed it about why SMA would act like that at the KBS award show. There are many factors: keeping her privacy, avoiding scandal, exhaustion from filming, having bad asthma, a secret crush at SJS (jk, not really lol). I can see how she comes off stuck-up to the public eye, but to my interpretation, it's not that she doesn't respect and support SJS, she is just being careful. Also, the netizans on SMA's IG-- well, they're normal comments by sometimes irate and jealous fans. The very exact things she had always wanted to avoid by keeping private about her love life. So yeah, give our girl a break. She shouldn't be misunderstood but it happens because this work is mentally brutal. They say the best way to understand an introvert is to communicate with them the best way they know how-- and between SMA and SJS, it's in the eyes, body language, and obscure flirty moments. Yeah, I said it. I'm not sure why there is so much criticism for SMA being 'awkward'. Anyone who has followed her in the past 15 years that she's been a model + actress would know this is how she carries herself. The industry she's in scrutinizes and watches her like a hawk because she's considered one of the goddesses simply for her 'bagel' figure (categorized by netizens and Korean media). When she was in Guerilla Date, she has said she wants to ban that label because it puts on a lot of pressure on her and I had never seen her put on such a sad face when she said that. As much as she tries to 'act calm and collected', she obviously wears a sensitive sleeve to her emotions in certain circles and public spaces. In interviews with SMA's celeb friends, including Gong Hyo Jin, they have often said that when you truly get to know the real SMA-- she is herself-- funny, charming, and exactly like many of the characters she plays (and sometimes it shows as we see on OMV, note: Christmas scenes). You're so right. She usually can act so naturally with her drama partners in front of public eyes, this time, I do notice her being a little bit different. When they were at the stage together receiving the best couple award, the looks SMA gave SJS and how he reacted...I just can't get over that GIF off my head right now. It's so not like drama partners. Hey now, don't forget we're in a SJS+SMA couple thread hahaha ;). I distinguish on-screen couples who have chemistry on a spectrum from 'gets each other' to 'transcends passion'. I think of Gong Hyo Jin and SJS's chemistry much like I think of SMA and Jo Sung Juk (My Love, My Bride). If you watch the press-con videos, they are so comfortable with each other like how I am with my close guy friends. But it's the few guy friends that I have secret crushes on that I am so shy and awkward around.